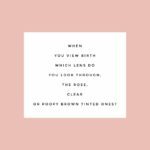 When you view birth which lens do you look through, the rose, clear, or poopy brown tinted lens? I'm asking because the way you view birth is important. It will effect the outcome of your birth experience regardless of what actually, physically happens on the day. Birth is 10% what happens and 90% how YOU think and a feel about it. And there is a heap of evidence out there to support my saying. Your experience doesn’t have to be a bed of roses nor a complete heap of poop for it to be positive. You dont have to like the way your baby is born BUT you do need to recognise your coping skills. You need to have a belief in your ability to use these coping skills. Use them to best effect when any waves of uncertainty come your way. Perspective is the most powerful thing you can have for positive birth experience. A clear perspective allows your mind to remain free from self doubt, worry and anxious thoughts. A clear mind impacts your feelings in a positive way leaving you feeling like everything is just right in your world. That place where everything is just in your world is a place where you feel calmness, confidence and courageousness. This is the formula that will bring about your positive experience. Finding your unique formula for birth is what we do when we work together. Which lens will you wear when you birth your baby? When we work together we take those brown ones off and toss them aside. We firmly place the clear ones on and then most of my clients switch to the rosy ones once they've realise their own inner brilliance. You can find their amazing birth stories all over our website.